How many years ago I cannot recall, but I do vividly remember the small gosu (cobalt-blue) cup, such a delightful color and so deep. I asked the gallery assistant about the cup and she said it was the work of Matsuzaki Ken. That was the first time I ever saw this Mashiko-based potter's work. I have since followed Matsuzaki's ceramic endeavors over the years, always looking forward to his yearly Tokyo exhibitions. I've seen Matsuzaki challenging his craft with new forms and styles and not becoming complacent about his work whatsoever. That always makes it refreshing, for as so many potters just rehash their successful styles over and over again. Just go to the prestigious Traditional Arts and Crafts Exhibition held every year - once is enough for me. It could have been easy for Matsuzaki to fall into a mode of relaxed success, for he has the credentials that ensure a cushy path. His father was a Nihonga painter and Mingei collector, while his teacher was none other than the famed Mashiko Living National Treasure Shimaoka Tatsuzo. It would have been quite easy to do the Hamada-Shimaoka range and sell quite well. Yet for any true artist the discovery of what lies within is as important as what is created. Matsuzaki kept the search light on. "Shino pottery, in its authentic style, has a scarlet color phenomena on its surface, somewhat like rouge brushed over white skin. This is one of the characteristics of Shino ware from the Momoyama period (1573-1603). 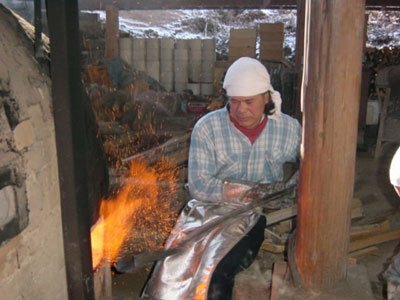 Creating Shino in a gas kiln naturally limits the possibilities. The gas itself is the limiting factor. But I wanted to see how far I could take the possibility of making Shino pottery in a gas-fired atmosphere. So far, I have been able to make Shino in the Suou (ancient purple red) and Sien (light purple) styles. For a long time I have wanted to challenge myself and to fire Shino ware in my climbing kiln, fired with wood. My climbing kiln has a very special form. Its first chamber has large fire mouths on both the right and left sides so that wood can be fed into the kiln from either side. It is as if the first chamber exists between these two fire mouths. I have dreamed of making Shino pottery in the first chamber of this kiln for a long time. For the past seven years I have been firing other types of work in the youhen style and trying to find the appropriate temperature zone in that chamber for Shino ware. After long, long deliberate considerations, I decided to try firing Shino ware in my climbing kiln using all the experiences I had accumulated making the light purple Shino ware in the gas kiln. My climbing kiln is especially designed to make ash-covered youhen (literally meaning changed by the fire/flame) pottery. The Shino work fired in this climbing kiln will definitely be influenced by the way the kiln is fired. Therefore, I wanted to focus on creating my own youhen Shino rather than making typical Shino. In order to do so, I needed to make the most of my climbing kiln. While I was loading the kiln and trying to place the work in a good place in order to get thatunique Shino, I couldn't help but feel uneasy. I couldn't stop worrying. During the firing I filled both fire mouths with a lot of wood as if to clear away my anxiety. Anxiety........adding the wood.......anxiety.....adding more wood, this was repeated for seven days. I stopped the firing after confirming that the work near the fire mouths were well covered with ash. The only thing left to do was to wait and hope that the cooling of the first chamber would go well. And in fact, the firing went very well and I was able to finish it with great satisfaction and a refreshed feeling." The above short essay was taken from his recent Tokyo-exhibition catalog. My write-up of that exhibition, plus some photos of his pieces, can be viewed by clicking here. Matsuzaki ash-glazed wares are also quite special. 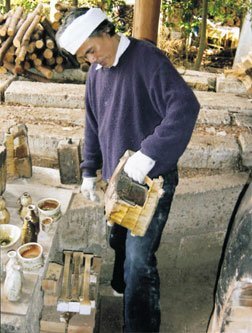 He uses matsu (pine) and kuri (chestnut) ash on most of the works and they fire to a pleasingly broad range of colors, mostly somber darker tones that fit in well with a reflective spiritual mind. Maybe that's why I like them so much. 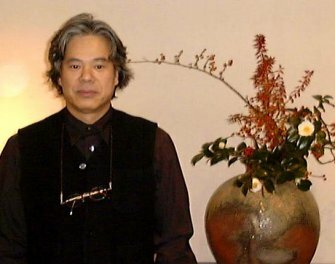 Matsuzaki was born in 1950 and graduated from the Fine Arts Ceramic Department at Tamagawa University in 1972. That same year he apprenticed with Shimaoka and that lasted for five years. 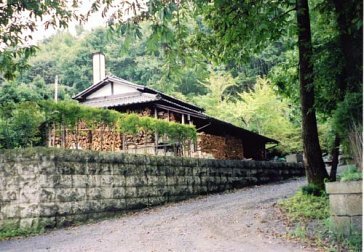 He established his own kiln, Yu-Shin (Playful Spirit) in 1978. He has exhibited in New York and will be exhibiting in Boston this summer. For those with Japanese browser capabilities, Matsuzaki's homepage shows dozens of his pieces. It can be viewed at www.yuushin-gama.com. For more in English about Matsuzaki Ken, please click here.